The story of the Rolls of Butter is undoubtedly Bonane’s best-known legend and is associated with a unique bullaún stone situated adjacent to Drom-Fiachna cemetery in the town land of Garranes. The Bullaún Stone itself is a flat-topped rock, embedded in the ground at one end, about two meters square with eight holes or bullaúns on its surface. Two or three of the holes are merely slight indentations the others are good-sized cavities. 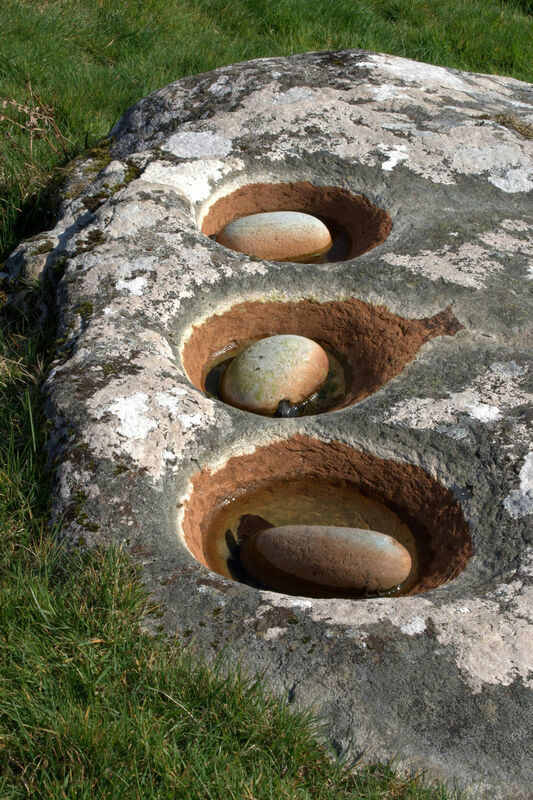 In each bullaún is a smooth oval shaped stone known locally as “the Rolls of Butter.” In the centre a quern stone represents the lid of a churn. The story of the Rolls of Butter is that a woman in the locality stole the milk of her neighbour’s cows on May morning. She was making butter with the stolen milk when Saint Fiachna came upon her. The good Saint, being as adept at cursing as he was at praying, petrified (turned into stone) the butter rolls she had made. He then pursued the woman across a nearby river where she suffered a similar fate! She still stands, as a large upright stone, in the town land of Gearhangoul, beside a bush that sprouted from a buairicín (wooden buckle) at the end of a short rope she carried for tethering the cows, intended by the Saint as a warning to sinners. Saint Fiachna’s curse on the poor unfortunate woman may well give credence to the view of some antiquarians that the Bullaún Stone and its eight spherical pebbles are in fact ancient cursing stones. Cursing stones are known to be associated with early Christian sites. For example the famous Cloca Breaca on the Island of Innismurray of the Sligo coast. The Bullaún Stone clearly dates from pre-Christian times and is believed to have been used by the Druids for ceremonial purposes. Indeed the Druids are said to have turned the cursing stones against King Cormac MacAirt when he espoused the Christian faith.